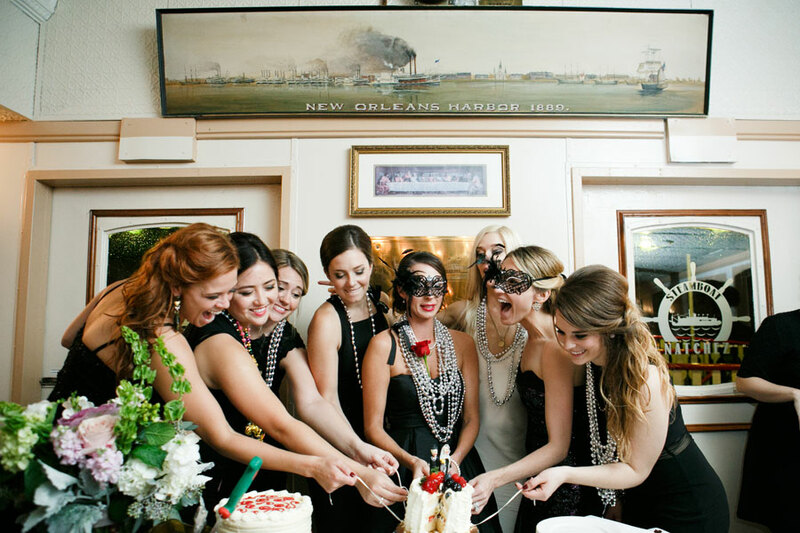 When it comes to celebrating in style, there is no place like the French Quarter. Bursting with historical beauty, a rich, one-of-a-kind culture, and unrivaled wedding venues, this is the most fun and exciting place to be, especially on the most special and significant day of your life. Weddings in the French Quarter are as unforgettable and unique as the city itself, capturing the romance and timeless elegance of historic New Orleans. 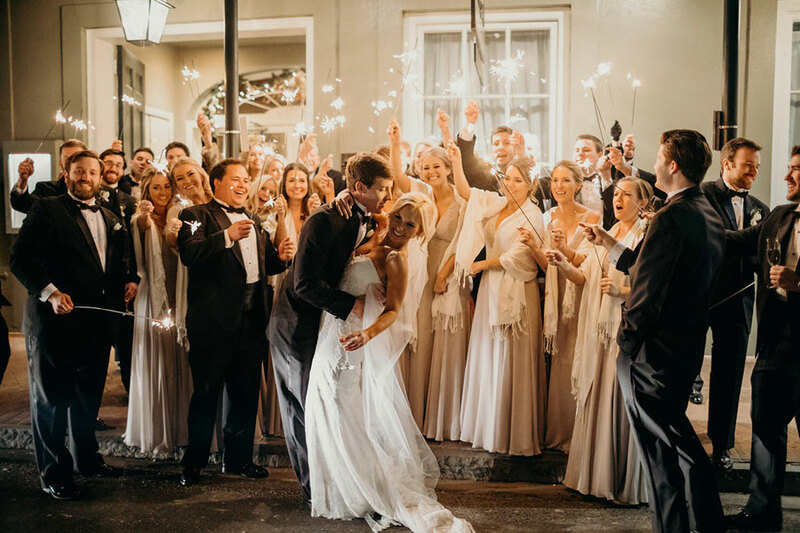 Romance, after all, has always found its home in the French Quarter and is one of the many reasons that New Orleans is a top wedding destination for those who want to live happily ever after. Caty met her husband-to-be, Brett, at a crawfish boil in Austin and soon discovered that not only do opposites really attract, they can withstand the challenge of a long-distance relationship. Falling head-over-heels in love, they planned a destination wedding in New Orleans after Caty fell equally in love with the music, food, and ambience of our city on a girl’s trip. 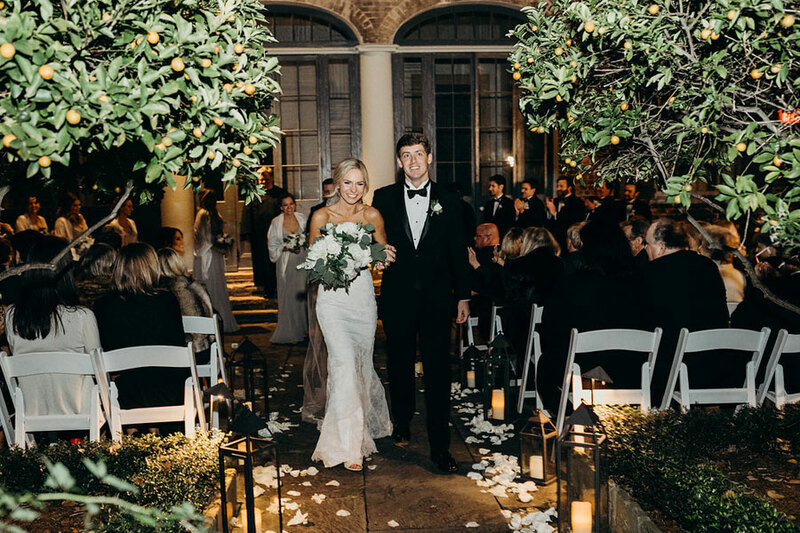 The young couple visited various wedding venues and became enamored with the ambience and charm of the lush and centrally located Maison Dupuy with its breathtaking and secluded newly renovated courtyard as the perfect backdrop for their authentic New Orleans wedding and reception. When Caty and Brett sampled the delicious food, all made fresh in house, their mouth confirmed what their hearts felt. Further, the Maison Dupuy offered them an all inclusive wedding experience for their one hundred guests. Not only could they stay in a lovely first-class corner suite with a wraparound balcony and wonderful views, but also the wedding and reception could be held there just an elevator ride away, and a team of culinary chefs would organize the reception menu “from soup to nuts!” Guests who arrived early enjoyed airboat tours, gambling at the casino, cemetery tours, cocktail tours, children’s activities, and shopping. 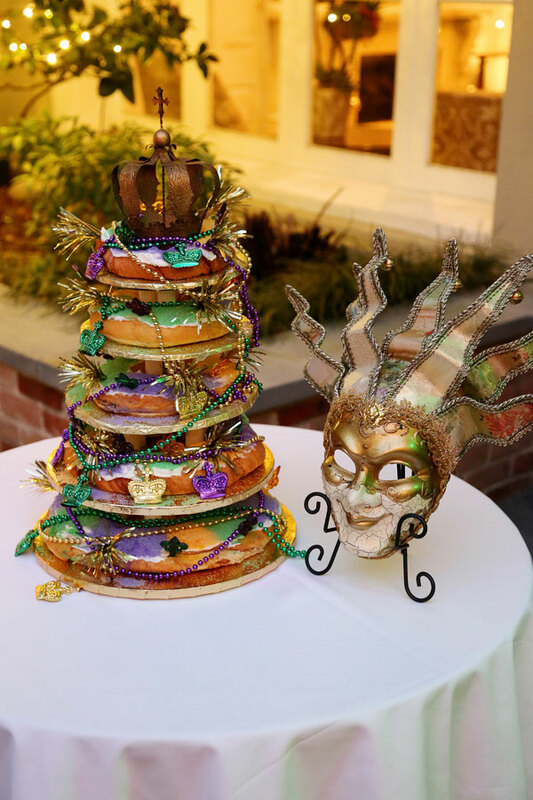 Caty and Brett’s wedding fell on the Saturday after Fat Tuesday and went off perfectly followed by a wonderful reception with Mardi Gras and fleur de lis decorations and King Cake! True to Brett’s German heritage, the family began with “The Grand March” and then gathered around in a circle making way for the new couple to have their first dance. Everyone agreed that the wedding was perfect, the food was delicious, and it was so much fun to be in the French Quarter. 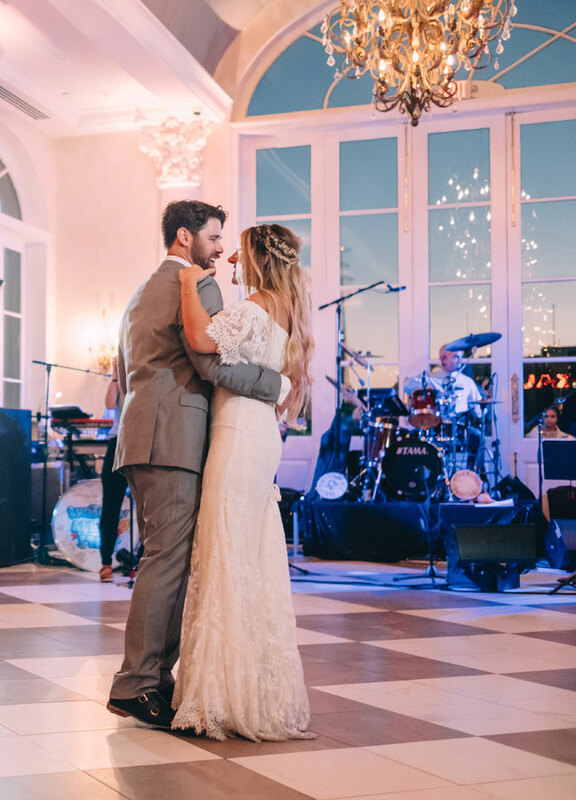 “Meant to be” is an understatement, and Caty and Brett felt so lucky to have found their happily ever after and to share a wedding in the French Quarter. Located in the heart of the historic French Quarter, the Maison Dupuy is a charming hotel offering an authentic New Orleans setting for your wedding ceremony and reception. Their newly renovated French Quarter courtyard provides a secluded, breathtaking venue to celebrate the most important day of your life. This beautiful backdrop for your reception can accommodate up to 200 guests, with the option of adding a custom tent to give you the outdoor experience in any weather! As the city's most unique boutique hotel, the Maison Dupuy beckons you to discover first-class New Orleans accommodations at their best. Your out of town guests will enjoy the location, just two blocks from Bourbon Street in the heart of the Vieux Carré. The central location makes it easy to explore the restaurants, shops and local attractions in the French Quarter before and after your special day. 1001 Toulouse Street, (504) 586-8000. Annalisa and Anthony met in Law School at the University of Miami; they sat next to each other for an entire semester with little conversation. It turns out that Anthony was a little nervous to approach her but later became her Facebook friend, liking every post about her dogs. Annalisa was born in New Orleans, and when she brought Anthony home to meet her family, he fell in love with “the best city in the world,” as Annalisa put it, and the only place to consider having a wedding. They selected Marché as their reception venue due to its unique and opulent space with a gorgeous and breathtaking view of the Mississippi River and St. Louis Cathedral. The wedding ceremony was held at St. Louis Cathedral, followed by a secondline with Kinfolk Brass Band to Marché. Kinfolk really brought the party and provided contagious energy, throwing it down with Beyonce’s “Crazy in Love” and other songs that had the guests dancing. The secondline stopped along the way to pay respectto a building that Annalisa’s late grandfather had owned. The food provided by Marché and the cake by La Louisiane Bakery were both amazingly delicious. Poppy and Mint provided stunning arrangements and even decorated the cake with flowers. The Bucktown Allstars brought classic rhythm and blues, soul, and funk, and Annalisa loved how they “threw a great party with their class act and interacted with our guests so well.” The newlyweds stayed at the Omni Royal Orleans Hotel and enjoyed breakfast on the balcony. This where Annalisa’s parents stayed the night of their wedding decades before. After the wedding weekend, the two animal lovers took a road trip with all three dogs to enjoy snow in Colorado. Everyone dreams of the perfect wedding venue with a romantic atmosphere, delicious food and drinks, and a stunning location. Marché offers all that and more with a one-of-a-kind classic space in the heart of the historic French Market. Whether you desire an intimate dinner for fifty guests or a spectacular reception for 300, their professional, courteous, and attentive staff will work tirelessly throughout every step of the planning process to assure that every detail of your event offers your guests a true taste of New Orleans. Their custom menus, décor, and live entertainment options ensure that your day will be picture perfect. Marché may also be combined with the historic Dutch Alley below for cocktail receptions or to accommodate larger groups. Their elegantly restored space features classic ivory tones and mixed metal accents which lends itself to every aesthetic from rustic shabby chic to romantic and sophisticated. They offer approachable yet sophisticated innovative cuisine with a passion for quality and artfulpresentation. Their premier wedding venue is walking distance from all of the finest hotels in the French Quarter and the historic St. Louis Cathedral, making it convenient for both you and your guests. 914 N. Peters Street, (504) 586-1155. Kristen met her husband-to-be, Michael, while they were both attending Louisiana State University and working together at Bear’s Po-Boys. After graduation from law school, she went on a girl’s trip to Canada and upon her return, Michael picked her up at the airport. She was starving and worn out and just wanted to eat and get some rest. Apparently, it is true that absence makes the heart grow fonder, as soon he was down on bended knee asking for her hand in marriage. They chose 19th century Federal-style mansion, Hermann-Grima House’s lovely courtyard for their wedding ceremony. Restored to the 1831 plan, the parterre gardens feature a variety of citrus, fig, pineapple, pomegranate, and pear trees. Their heritage roses and period camellias offered a “ribbon of color” in the gardens and a perfect backdrop for their wedding. 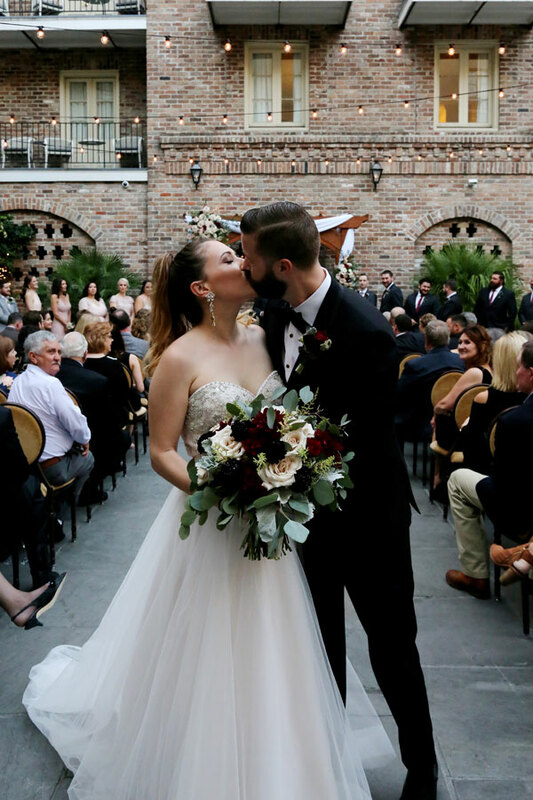 They searched for a venue that offered a lush outdoor setting as well as an indoor area with an open floor plan and found the historic New Orleans vibe of Broussard’s to be the perfect place for their reception. It had a gorgeous urn in the center of the courtyard that she loved and one of the oldest trees in the French Quarter. The beauty of the restaurant and the history of the courtyard was truly impressive. Additionally, the historic Hermann-Grima House was connected, which offered a rustic backdrop for their ceremony. The Nola Dukes Band played a unique mix of jazz, soul, and old school favorites that gave the guests “happy feet” so well that Kristen’s grandmother had to have steroid injections in both knees after dancing all night! 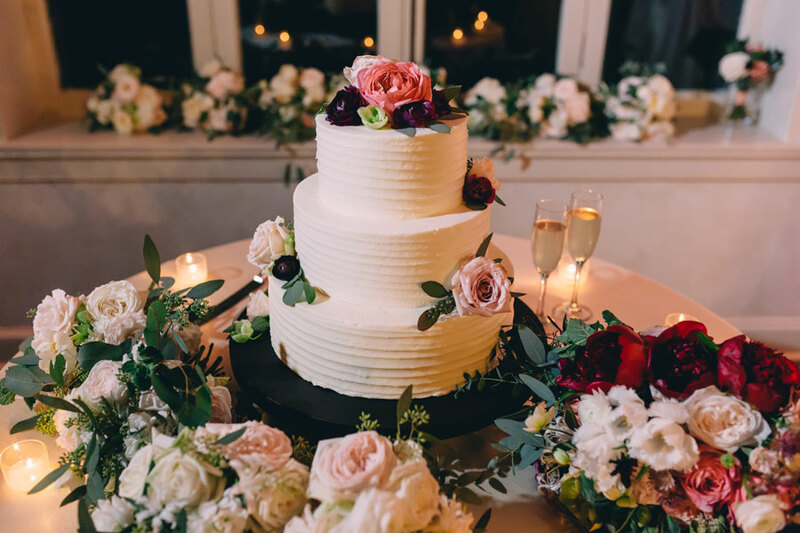 Kristen and her husband enjoyed a tradition that is as beloved as red beans and rice on Monday night--the “cake pull” on their beautiful cake with her parent’s wedding topper. The history of cake pulls can be traced back to Victorian times. Originally called “ribbon pulling”, a bride has tiny silver charms attached to ribbons or bracelets embedded in the cake for her single friends and bridesmaids to pull out before the cake is cut. Each charm has a different meaning, such as: a high chair forthe next to have a baby, a chili pepper or hot sauce bottle for a red hot romance, a telephone for good news, a flower for a blossoming relationship, a ring or bells for next to be married, a heart for true love, an oyster with a pearl for prosperity, a fleur de lis for a new beginning, or a lamp post for a bright future. 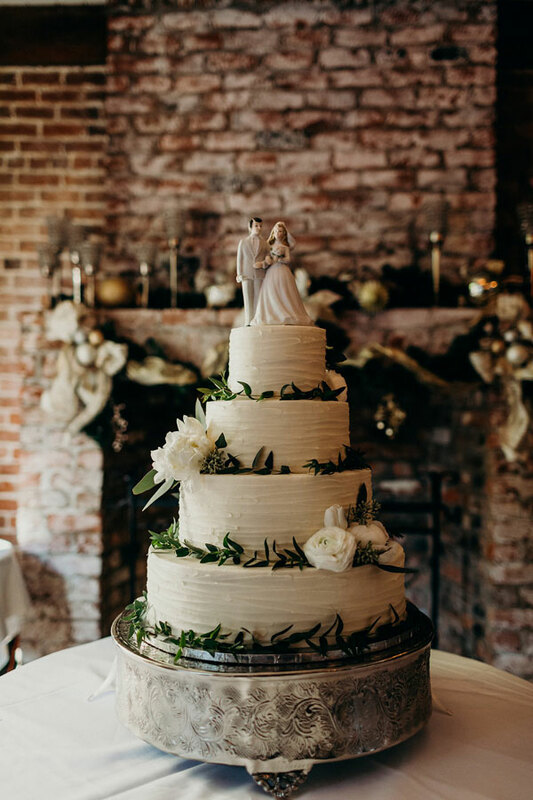 Broussard’s is one of New Orleans dining’s grande dames and is the perfect place for rehearsal dinner parties, showers, weddings, and bridal luncheons. It is a scenic and historic setting that reflects our city’s rich culinary tradition. The century old wisteria beside the fountain in the lovely French Quarter courtyard provides the ambience that every couple seeks when planning their wedding events, whether they prefer to order from a menu or serve themselves “reception style” from many uniquely New Orleans choices. 819 Rue Conti, (504) 586-1155. 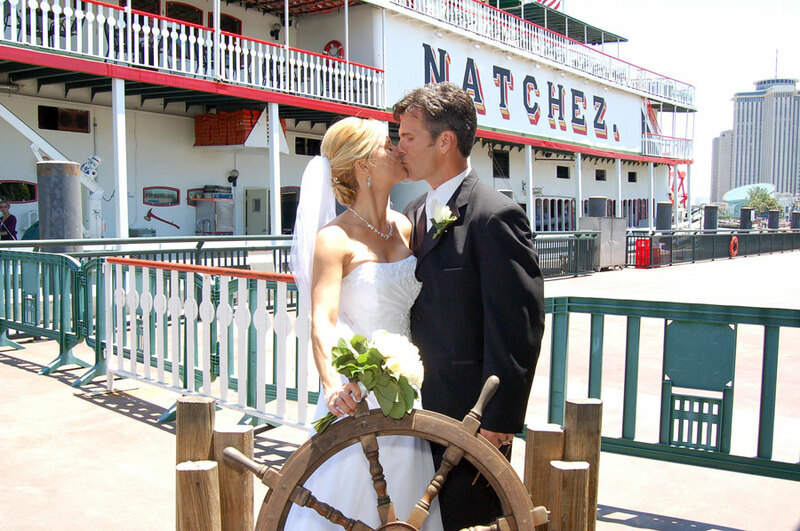 There are so many options in wedding services to consider in New Orleans…What could be more romantic than expressing your love aboard the Steamboat Natchez as the sun sets on the mighty Mississippi? 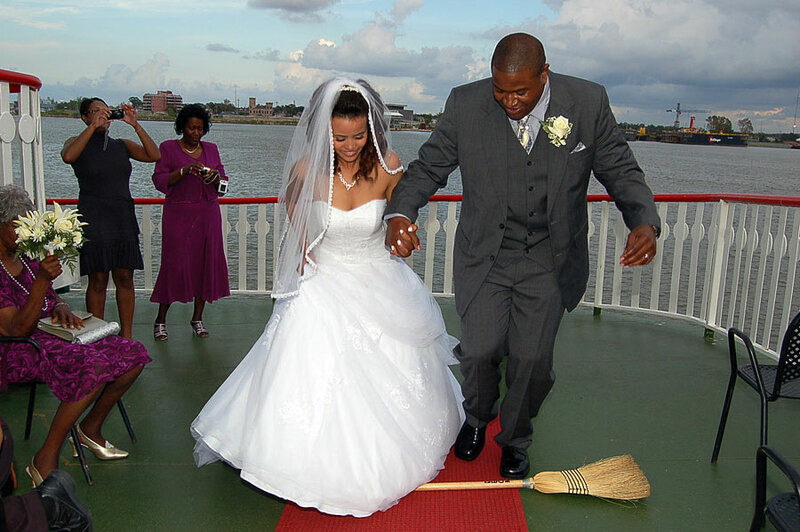 Serving single couples or hundreds of guests, this last authentic paddle-wheeler is an icon of New Orleans and offers catering and entertainment options for your bridal shower, bachelorette party, rehearsal dinner, wedding, or reception. Captains can perform the ceremony or you may invite your own officiant. Food is created fresh on board, and full packages include cakes, flowers, photography, entertainment, and more. Breathtaking views of the beautiful city skyline while floating down the Mississippi River make for a memorable event for up to 350 guests. (504) 569-1431. K-Paul’s Louisiana Kitchen is a legendary French Quarter restaurant serving upscale Cajun and Creole dishes with top-quality service and atmosphere. The upstairs has rooms and a beautiful balcony overlooking the French Quarter just perfect for a wedding reception, rehearsal dinner, or bridal luncheon. K's Parlor, an enclosed private room on the second floor, can also host parties and other special occasions. Downstairs is an intimate climate-controlled courtyard giving you an authentic New Orleans ambiance for dining al fresco that would be ideal for small wedding receptions and events. Both floors feature an open kitchen where diners can see exactly how each delectable dish is prepared. Award-winning Chef Paul Prudhomme and his wife K opened this restaurant in 1979, and it quickly became a sensation as many customers claimed it was the best Cajun and Creole restaurant in New Orleans. Today the family tradition continues as Executive Chef Paul Miller, who was mentored by Chef Paul and his wife, Brenda Prudhomme, the niece of Chef Paul, go to great lengths to ensure the highest quality food. Chef Paul states, "We have three kitchens and a bakery at K-Paul's and the philosophy and commitment to excellence will never change. We have no freezers in the restaurant and only the freshest ingredients of the highest quality are used. This is why we change our menu daily." 416 Chartres Street, (504) 596-2630. Tessa Makeup Artistry will ensure that any bride looks her best by serving her before and during her wedding for a flawless appearance all day long. Tessa is a licensed esthetician as well as a media and bridal makeup artist who has trained at the renowned Award Studio in Burbank, CA and also trained and assisted under makeup artist and developer, Ashley Sievert. She treats each face as a unique canvas, and her services include traditional makeup application, HD airbrush makeup, lash application, and even grooming for the groom! (504) 676-8424. Consider these lovely options and more to make your special day as unique as the love it celebrates with a French Quarter wedding rich in history, tradition, charm, and elegance. Each location has a story and details that give it a quality all its own. 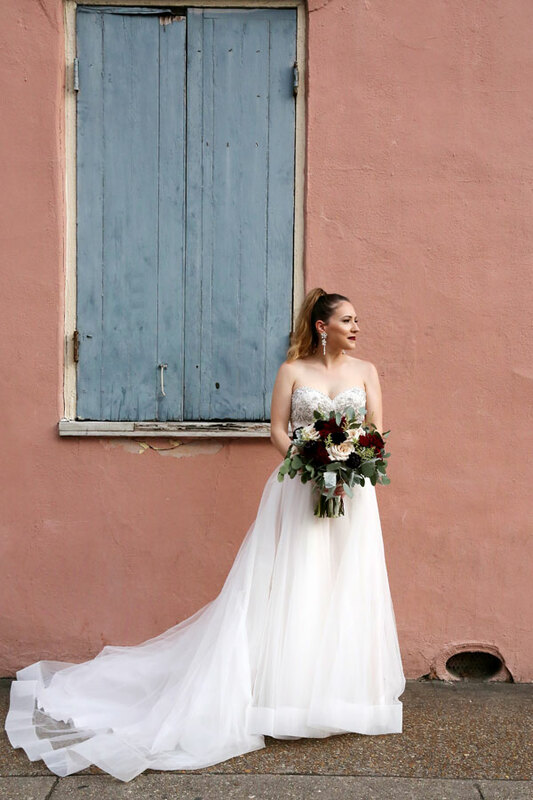 For sweep-you-off-your-feet, over-the-moon romance, there is a gem in the French Quarter to inspire dream-worthy visions of your nuptials.